Divorce can be difficult enough in terms of figuring out child custody and support, assets, and spousal support, without also having to figure out and address retirement assets. Still, dividing retirement accounts and pensions is one of the top things fought over in divorce. Because different rules govern different types of retirement accounts and dividing up plans like the 401(k) and pensions is separate from the divorce agreement, you want to make sure that you work with an attorney who is knowledgeable and experienced in drafting retirement allocation documents like these. Not only do the 401(k) and pension assets often represent a couple’s largest source of funds, but if they are not properly divided upon divorce, there can be excessively high penalties and taxes (not to mention an incorrect and unintended amount of the funds going to an ex). First, if you are entitled to a portion of your ex’s workplace retirement plan (including 401(k)s and traditional pension plans), the only way that you can access your share is via a qualified domestic relations order (QDRO). While the QDRO is based on the divorce agreement (decree), it is also technically separate from it. In addition, there is a separate order required for each retirement account that is subject to division. You and your attorney will need to carefully examine the QDRO before it is submitted to the court to ensure that any essential elements of the divorce agreement are reflected in it. For example, if funds are being transferred to a rollover IRA, the QDRO needs to explicitly spell that out. Or, if one spouse wishes to receive the money directly instead of transferring it to a rollover IRA, this type of distribution also needs to be specified in the QDRO. Remember that divorce is one of the few contexts in which 401(k) funds can be accessed prior to turning 59.5 years of age without incurring a 10 percent penalty. Your attorney will also typically need to contact the retirement plan’s administrator to ensure that everything is in place for a smooth transfer of the funds—whether that is happening immediately or at some point in the future. Keep in mind that once a QDRO is in place, the plan administrator must approve it. The transfer will then take place. 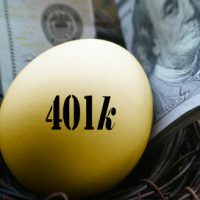 Keep in mind that 401(k) assets are protected if the individual has filed for bankruptcy, but IRAs are not. If you are dealing with retirement funds in your divorce, you need to speak with an experienced divorce attorney right away to figure out how these accounts will be addressed. Contact one of our experienced 401(k) and pension plan family law attorneys at the Arwani Law Firm today to find out more.